We know that you can do flexible search for multiple destinations for a specific date with a fixed source airport. For example, if you want to fly somewhere for a weekend from London, but don't care where exactly and want to see the prices, you can use either Google Flights or SkyScanner, type "Europe" as a destination and see the possible destinations and prices. Is it possible to do the same search with fixed destination airport? What I mean is that I want to be in Heathrow on 1st, and I want to know from which airport around Europe it would be the cheapest to fly there on this particular date? So kind of "Europe" - > "LHR" search? 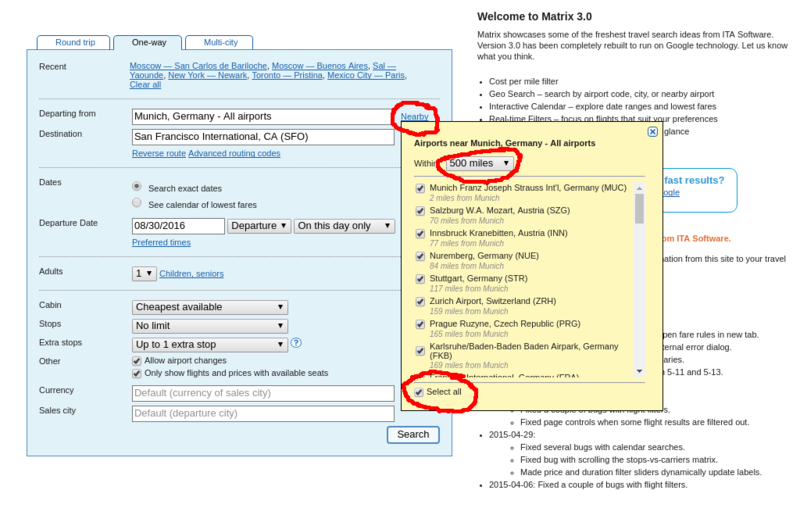 Edit: I know it is possible to do broad search from a source airport to multiple destinations. However I'm looking for the opposite - a search from many origins spawning multiple countries to one specific destination airport. To be very specific: I want to type in "Europe" into the origin (not the "list of a few airports)", and "SFO" into the destination (not the "USA"), and see the flights with prices for the particular date. Neither Kayar, nor ITA Matrix, nor Skyscanner, nor Google Flights seem to allow that. Is there an app for Android to look for flights with a “go anywhere” option search?